That’s my Sleepy Monkey Blanket which I designed for the Spring 2009 edition of Twist Collective. No, that’s not a second blanket – it’s reversible! My 3 boys aren’t babies anymore. These days, they’re far more apt to take a touchdown pass than a nap. But as I was knitting this blanket, it was fun to think of how they would have enjoyed it when they were little. I imagined naptime, when they might have “read” the blanket as they sat on my lap: “Look! There’s that silly winking monkey! And there’s that sweet little kissing monkey! But where did my sleepy monkey go?” Surely, they would have named each of those monkeys. Hopefully, they would have picked a favorite – a funny little friend to guide them off to Dreamland. We’re still not sure if those are Life Savers, Jelly Rings or Fruit Loops on the back. But, I am pretty sure it would have been fun to pretend my monkeys and I were gobbling them up. The final, chosen colorway used Valley Yarns Superwash Merino. The “virtual swatch” on the left used colors from Valley Yarns Sugarloaf Merino/Acrylic. Both of those yarns are available through WEBS. 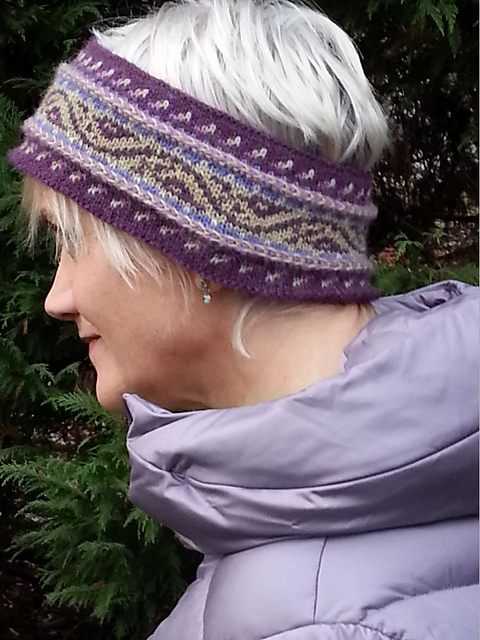 The “virtual swatch” on the right used colors from Dale of Norway Freestyle 100% washable wool. That yarn is available from…hey, that one’s from ME! Wow! In no time at all, I’ve had quite a few requests for more Freestyle colorways. So, at the bottom of this post, I’ve added a few more “virtual swatches” (colorized charts, not knit samples) based on Freestyle colors. If you like to knit in the round, you might like to steek your blanket, as I did. (There’s a mini-tutorial on this topic within the blanket pattern. You can also read my detailed article on steeks here.) If you’re using a soft, superwash yarn, you’ll want to machine-sew your steeks – soft yarns are too slippery for crocheted steeks. If you’re using the same motif layout shown in the example, you’ll want to use worsted or aran weight (4 to 4.5 sts/inch) yarn so that your squares’ circumferences will be large enough to wriggle through the machine. (Of course, if you add a(n) extra repeat(s) of the monkeys across your blanket, you can get away with steeking a finer gauge yarn.) If you choose to knit your squares flat, by machine or by hand, there’s no circumference to reinforce and open up, so you can use any gauge your heart desires. Whatever your choice, I hope you and your mokeys have endless fun. And in case those rings on the back turn out to be Jelly Rings, save some for me! This entry was posted in Blogroll, Knitting, Mary Ann's Designs, Norwegian Knitting, On Twist Collective and tagged baby, baby blanket, baby knitting, Dale of Norway Freestyle yarn, fair isle, knit, Knitting, knitting pattern, lovey, mary ann, Mary Ann Stephens, merino, monkey, monkey blanket, nordic, norwegian, play mat, reversible blanket, sleepy monkey, steek, steeked, steeks, stephens, stranded knitting, stroller blanket, superwash, twist collective, valley yarn, washable merino, washable wool, wool, worsted weight yarn. Bookmark the permalink. thanks so much for all the color samples. i’m eager to make this blanket. it’s super cute. would the # of balls be the same for the freestyle with the slightly smaller yardage/ball? That’s a good question! DofN Freestyle has 80m in a 50g ball; the VY Superwash I originally used has 89m in the same, so we’re talking about a 9 meter per ball difference between the Superwash and Freestyle. Colors D & E (red/crimson and colonial blue/medium blue in the original) use just 2 balls each, so in those cases, you’re only talking about an 18m difference, or about 1/5th of a ball. I think it’s pretty safe to say that, if I had ended up with just 1/5th of a ball of any given color, I probably would have suggested a 3rd ball, for you never know how much folks might use up in swatching, loose ends, etc. But, I didn’t, so, I think you’d be safe sticking with 2 balls for those colors, for you only need a little bit of wiggle room and it’s probably safe to say that’s already built in. On the other hand, for colors A & B, which use 5 & 4 balls of Valley Yarns Superwash respectively, the difference (5 or 4 times 9) could add up to about half a ball. Now, if I had half of ball of a color left over, or even a good bit less, I’d say that would be a fine amount of leeway and I would not have raised the suggested amount. So, in those cases, we might not have as much wiggle room as you need (5 or 4 x 9m). While I can’t swear it will be necessary, I’d recommend getting an extra ball of each A & B if you switch to Freestyle. And for Color C, I’m on the fence, but I’d lean toward going for the extra ball since that’s the background color and a change in dye lots would be particularly noticeable there. Aw, thanks! I’m glad you like it! Yes, I did design the little sweater as well – you’ll find it as a free pattern, “Monkster Gets Stranded”, on my on-line yarn shop, Kidsknits.com. Here’s the link: http://www.kidsknits.com/free/monkstergetsstranded.html Have fun!